The future of health care holds promise for patients as the medical community continues to accelerate its knowledge of diseases and the cures needed to improve and save lives. Recently, at the 2014 Milken Institute Global Conference, John Noseworthy, M.D., CEO and president of Mayo Clinic, joined other panelists and moderator, Melissa Stevens, Deputy Executive Director, FasterCures, in "Chasing Cures: Reinventing the Business of Medicine" to discuss how health care organizations need to create new strategies to speed and improve medical progress as well as how to involve patients in the search for new therapies. "The needs of the patient come first," stated Dr. Noseworthy as he began his discussion on how the current, unsustainable health care delivery system poses a challenge for providing quality care at an affordable cost. He explained how this challenge provides Mayo with an enormous opportunity to scale its medical knowledge and deliver it to individuals through education. 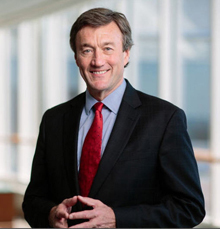 Beyond engaging patients in their own health, Dr. Noseworthy emphasized how Mayo continues to improve patient care and to determine the cost for better outcomes through its partnership with Optum Labs. The collaborative and creative insights drawn from big data will provide answers to what's happening in health care such as patterns in health care consumption, desired outcomes for diseases, and understanding the costs associated with better outcomes. Watch the entire panel discussion below.